Is Eating Lunch Meat While Pregnant Safe? Almost everyone you know probably eats lunch meats, which are precooked, sliced meats often used for sandwiches and the like. Also called deli meats, sliced meats, or cold cuts, these processed meats are common food items found in almost every grocery store and restaurant. Because these foods are so common, people sometimes still wonder if it is okay to eat lunch meat while pregnant. Is It Safe to Eat Lunch Meat While Pregnant? Can you eat lunch meat when pregnant? Experts warn that it is not safe to eat deli meat while pregnant unless it has been well heated and steaming hot. 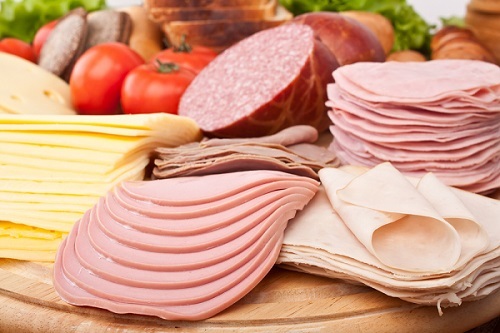 Deli meats like ham, salami, turkey, bologna and hot dogs can cause listeriosis, a type of food poisoning. Bacteria called Listeria monocytogenes, which may be found in processed meats, can cause listeriosis. However, heating deli meats thoroughly until they are steaming hot may kill the bacteria present. Although most adults do not get sick after eating contaminated food, consuming Listeria-contaminated lunch meat while pregnant can be dangerous. Aside from the bacteria, cold cuts contain a high amount of fat and salt. These can cause high cholesterol, high blood pressure and heart disease. They also contain large amounts of sodium nitrate, a preservative used in processed meat products. Some specialists believe that sodium nitrate can be carcinogenic and can also lead to complications in pregnancy. How Does Listeriosis Affect Pregnancy? The symptoms of listeriosis may appear days or weeks after consumption, and usually include fever, chills, diarrhea, upset stomach, stiff neck, muscle aches, loss of balance, headache and confusion. In serious cases, pregnant women can die. Remember that compared to other people, pregnant women are much more likely to acquire listeriosis. In fact, 1 out of 7 people with listeriosis is pregnant. How does listeriosis affect you and your baby? Most of the time, however, you may not feel sick when infected with Listeria. Nevertheless, you can pass on the infection to your unborn baby without knowing it. This is why it is very important to prevent listeriosis while pregnant. If you eat deli meat while pregnant and experience the symptoms described, consult your doctor immediately. Listeriosis can cause miscarriage during the first trimester. However, during the third trimester, you are more likely to be at risk of getting sick. Furthermore, this type of food poisoning can cause premature labor, delivery of an infant that has a low birth weight or infant death. Late infection in a fetus may lead to development of various health problems such as mental retardation, seizures, paralysis, blindness and other organ impairments. It can also cause meningitis and blood infections in newborns. Before handling food, wash your hands thoroughly with warm water and soap. Dry them with a clean towel. Remove the lunch meat from its packaging and place it on a clean plate. Put the plate into a microwave and cook in high heat. Depending on the quantity of meat you are heating, cook for 30 seconds to 1 minute. Watch closely as it cooks. Check the lunch meat temperature using a meat thermometer. You need to heat the lunch meat to 165°F to kill all bacteria and parasites before consumption. Remove from the microwave and consume immediately. What Else Should Be Avoided During Pregnancy? Except for lunch meat, there are other things you should avoid in order to protect yourself and give birth to a healthy baby. Avoid eating undercooked or raw burgers and steaks since they can harbor bacteria such as toxoplasma. If you are dining out, order meat well-done and steaming hot. At home, make sure that your whole cuts reach at least 145° F, ground meats at 160° F, and chicken breasts at 165°F. To avoid juices from raw chicken or turkey from mixing with the stuffing, buy frozen pre-stuffed poultry. Cook directly from frozen without defrosting. Make sure the thigh meat has a temperature of 180° F.
Although fish is good for everyone, avoid fish that are known to have high levels of mercury. These include swordfish, king mackerel, tilefish and shark. Experts recommend eating up to 12 ounces of fish and seafood weekly, but choose those with low mercury content such as catfish, cod, salmon and canned tuna. Limit your intake of albacore to 6 ounces/week. Consult your doctor about taking fish oil or other supplements during pregnant. It is recommended that pregnant women should avoid refrigerated meat spreads. Meat spreads or pâtés contain meats that can harbor listeria. Keep your fridge temperature at or below 40° F to help slow the growth of bacteria. Although not really healthy, canned meat spreads like Spam are safe to eat during pregnancy. Avoid eating refrigerated smoked sea foods during pregnancy, including smoked salmon (lox), smoked trout, cod, tuna, whitefish and mackerel. However, it is safe to consume smoked seafood in cooked meals, such as casseroles. Bacteria and parasites are generally found in raw shellfish and seafood. However, thoroughly cooked shellfish is safe to eat when pregnant. Cook your oysters, mussels, and clams until their shells open. Throw away those that do not open. Never take milk that has been freshly collected without undergoing pasteurization, which protects you from listeriosis. Buy milk products like cheese and other dairy products that are labeled "pasteurized" only. What Causes Vaginal Odor? What Can You Do? Blood in Breast Milk, What's Wrong With Me? What Is Epithelial Cell Abnormality?